Wasn't excited about this rack bypassing my rack mount points and using its own rod through the rear wheel, but it seems to be working fine. Since my Synapse lacks any mount points near the seat post, the seat post is an odd size for a new collar, I kinda had to jerry-rig attaching the top of the rack to the seat stem. It would've been nice if this came with more flexible hardware to mount directly around the seat stem (a simple, adjustable collar or something). Overall happy for the price. 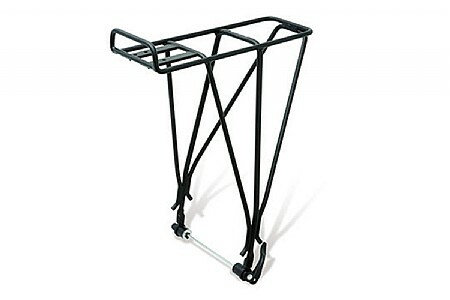 This rack is great for your typical mountain bike with no easy way to mount a rack. Combined with the Problem Solvers Seat clamp w Rack Mount Threads this will fit on nearly any mountain bike. I bought this rack to accommodate my cannondale mountain bike w disc brake. It has a 29 tire and the rake works perfectly. I use the rack to bring my toddler along on rides w the family. Its wonderful. Great solution if you have a road or mountain bike that lacks rear drop-outs - and you need a rack. My dropout-less mountain bike can now be used for treks, thanks to this rack. This is the only mainstream (i.e., not $100) rack I could find that uses a special long skewer to provide base support. My only issue was the lack of clear documentation of what you get - and don't get - in the package. You get all the hardware you need to attach to seat stays in the front. However, my mountain bike doesn't really have stays that could work. I had to solve the problem with a Salsa Post-Lock, which is a seat post collar that provides mounting points for the Blackburn rack's extenders. Result is rock solid, and I highly recommend it. Only bummer is that the Salsa Post-Lock is 1) expensive $30 and 2) rare. You'll almost certainly have to buy it on the internet. And the Post-Lock kind of ruins the bargain you'd have with the Blackburn alone. Works very well. The piece that was supposed to go around the seatpost wasn't big enough to go around mine and then still have room for the screws, but i went to lowe's and found something similar enough to make it work. No rattling or movement at all when on rocky trail for miles and miles. Bought this rack for my bike with disc brakes. When ordering it, I didn't notice the design that it mounts on the rear wheel skewer. I thought it was specifically for bikes with disc brakes, not a bike with disc brakes AND no mounting holes. This rack isn't needed unless you don't have normal mounting locations. Trying to deal with this rack being mounted on your rear skewer on the road to change a flat seems like a nightmare. Sending it back.